I don't usually let many bright colours into my country home, I am very much a black and white gingham or black and white toile style girl, I love surrounding myself with white and natural colours. But spending time at my sister and brother in-laws beach house I found each day quite invigorating living with all the colours in the living room. It's funny actually, I packed our bags, baskets of beach stuff and food & fruit and threw in some extra things that I thought I might need, a few bright tablecloths and some orange Dahlias, (everyone needs flowers whilst your at the beach) and when I unpacked my things I realised that nearly everything was either orange or yellow. I was surrounded by colours and such beautiful colours too. This house has wonderful pieces of furniture in all the living rooms and bedrooms, Lloyd Loom woven fibre furniture, sweet little old wicker chairs and a dining table to die for (more on that on a later post). Australian original "Mambo" door shades, great size coffee tables (and yes, this table is very similar to the ones that Brooke Giannetti from Velvet & Linen gave away late last year). The rug in the living is fantastic and made from lots of tiny leather off-cuts, it's perfect for a beach house with many little sandy feet running through. There are huge comfortable modern sofas with big cushions and wonderful pieces of interesting artwork hanging on the walls in each room. I think Georgy, Andrew's sister, has done an amazing job decorating this home. A beach house needs to be beautiful and really comfortable and she has definitely achieved that here. We picked as much fruit from our trees in our country garden to take to the beach, some ripe, so not so ripe and filled this wonderful old wooden grain bowl with peaches and plums. 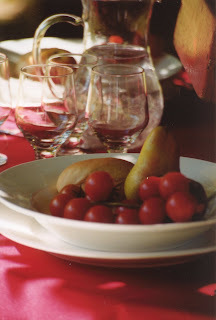 The colours were gorgeous and the fruit was delicious, what wasn't used for munching on was then stewed for breakfast. This is only a small part of this beach house ( the bedrooms are divine and all white) and it's part of my Summer homes and decorating stories. There's quite a few more boat houses and entertaining ideas to come over the months ahead. I know many of you are still surrounded by snow and I'm sure your starting to plan your summer holidays, why not come over here to Australia, it's a great place to be. Actually, hang on, when you get to Summer we will be in Winter, so why not come on over now. Welcome to all my guests from Susan's Table scape Thursday party at Between Naps on the Porch, it's a little different style "coffee" table setting this week. I'm very happy to say that when visitors come by my blog they do stay and look around for a quite a while. and this is really exciting news ! Also coming soon, our "Styling" shop full of interesting props & vintage clothes, furniture and bric a brac and some Coty and Andrew designs as well. I will keep you up to date as to when the opening "on line" and " our store" at Bowral will be. Now I can't wait to see what you will have in both the online and local shop... I'm sure it will all be as tempting as the beach house.. I really needed to see these pictures to remind me that, I too will see the beautiful of spring and summer again. I love all the color! Thanks for sharing. Oh it's so delightful to be warmed by your photographs as I'm chilled by this winter and a bad cold! Thanks for the lift! So beautiful to look at, while we are here in Texas on such a cold, rainy, dreary day! Thank you for the cheer! Oh, Coty, I loved this. Your summer retreat looks like a place to relax, recharge those creative batteries, and dream. Hi Coty! I love your gorgeous photos and your coffee table setting is so beautiful! The view just completes it! Thanks for sharing your talent. Your photos are so wonderful to experience. I just have to follow you! I love those fruity sun kissed colors. They are completely opposite to the gray of winter around here right now. I visited the website and noted that their goal is to "build Australia’s market share of targeted travellers through increasing demand." You're certainly creating interest in visiting Australia among your readers from throughout the world! Your photographs are, as always, superb! The colors, composition, lighting ... all amazing and as beautiful as anything ever published in a glossy, high-end magazine. It seems that Andrew has "an eye" as well. He captured his bride in a contemplative moment in that lovely, subtle, Vermeer-like image. Beautiful! Have you ever come to the West in America and done styling and photo's??? What camera do you use???????????? ?